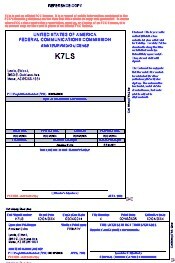 To print a license certificate suitable for framing, click here. The FCC has an option on their web page which allows you to print a reference copy of your license. It is intended that you use a portion of this license printing to put in your wallet. However, when you print it from the web it is much too large to fit into a wallet, at least the size of wallet that I have. You can use this web page to print out a copy of your license that is appropriate for framing and hanging or for laminating and including in your wallet. There have been 16602 certificates created since April 19, 2011. Note: This web page will only generate copies of currently active call signs. Question: What is the relationship between transmitted symbol rate and bandwidth?